IEP Goals: Given an activity containing a picture of something happening, STUDENT will use his/her inferencing skills to determine what has, what will, or is happening, with 80% accuracy, in 4 out of 5 opportunities, by MONTH, YEAR. 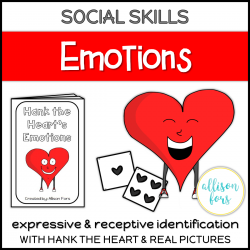 Given pictures of people doing a variety of activities, STUDENT will identify the emotion being portrayed and describe how the people are feeling, with 80% accuracy, in 4 out of 5 opportunities, by MONTH, YEAR. 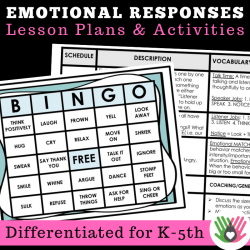 IEP Goals: Given a scenario where there is an evident emotion being described, STUDENT will receptively identify the emotion and tell how the person is feeling, in 4 out of 5 opportunities, by MONTH, YEAR. 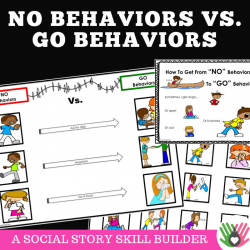 IEP Goals: Given a board game containing social thinking questions, STUDENT will provide an appropriate response explaining how he/she feels and what he/she would do to improve, change, or respond to the situation presented, with 80% accuracy, in 4 out of 5 trials, by MONTH, YEAR. 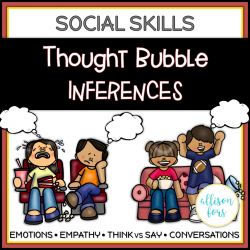 IEP Goals: Given a choice of two conversation starters to choose from, STUDENT will select one and initiate an on-topic conversation with a peer (teenager/young adult), with 80% accuracy, in 4 out of 5 opportunities, by MONTH, YEAR. 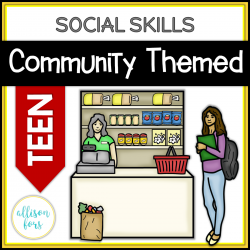 Given a social scenario which may arise out in a community setting, STUDENT will provide an appropriate response to include a solution in order to resolve a problem (emotional or physical),in 4 out of 5 opportunities, by MONTH, YEAR. Friendship Activities: Is It...Kind or Unkind? 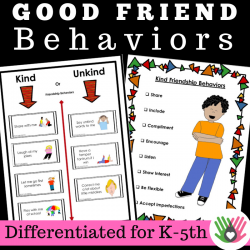 IEP Goals: Given interactive activities to help understand good friendship behaviors, STUDENT will identify kind and unkind behaviors through listing, naming, and labeling tasks, with 80% accuracy, in 4 out of 5 opportunities, by MONTH, YEAR. 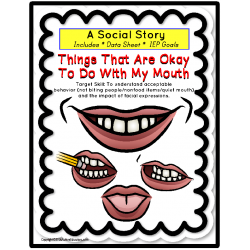 IEP Goals: Given a social story about what is okay and not okay to do with your mouth (no biting, eating non-food items), STUDENT will refrain from putting non-food items in his/her mouth, in 4 out of 5 teacher observations, by MONTH, YEAR. 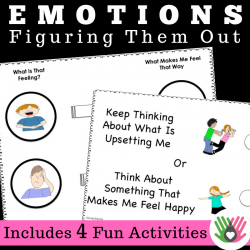 IEP Goals: Given strategies and tools to aid in understanding and coping with a range of emotions (ex.happy/sad/mad), STUDENT will refer to these strategies (ex. take a deep breath, think of something that makes you happy)in order to self-regulate behavior to avoid a meltdown,in 4 out of 5 occurrences, by MONTH, YEAR. 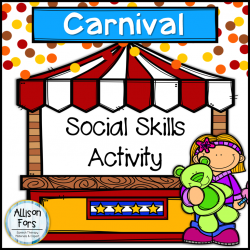 IEP Goals: Given a social skills game in a small group setting, containing scenarios that would evoke an emotional response (ex. missing someone, sadness, joy, fear), STUDENT will provide an opinion or response of how the situation would make them feel and what they can do to change it into a positive experience, with 80% accuracy, in 4 out of 5 opportunities, by MONTH, YEAR. 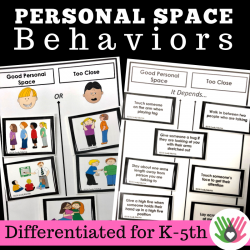 IEP Goals: Given a social story, follow-up activities, and pre-taught strategies in order to respect personal space amongst peers and adults, STUDENT will refer to these strategies with 80% accuracy, in 4 out of 5 opportunities, by MONTH, YEAR. 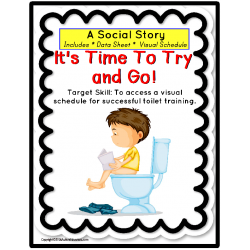 IEP Goals: Given a visual schedule, sequencing cards, and a social story to include the time to go and a reward card when finished, STUDENT will enter the restroom and sit on the toilet when it is time, without protesting, in 4 out of 5 opportunities, by MONTH, YEAR. Given a visual schedule, sequencing cards, and a social story to include the time to go and a reward card when finished, STUDENT will enter the restroom and complete the process, in 4 out of 5 opportunities, by MONTH, YEAR. 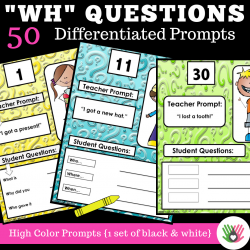 IEP Goals: Given a sentence or statement about a topic, event, or emotion, provided verbally by the teacher, STUDENT will provide up to three on topic "wh" responses (who/what/where/when/why) with 80% accuracy, in 4 out of 5 opportunities, by MONTH, YEAR. 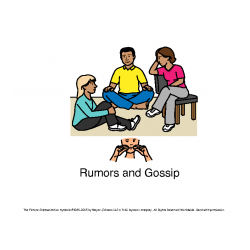 IEP Goals: Given a social story about reminders not to gossip or spread rumors, STUDENT will refer to the story when in need,in 4 out of 5 opportunities, by MONTH, YEAR. 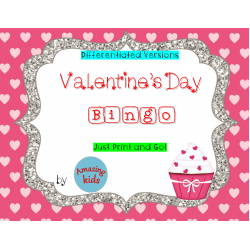 IEP Goals: Given a variety of matching activities, STUDENT will match by attribute (color, shape, size, time) with 80% accuracy, in 4 out of 5 opportunities, by MONTH, YEAR. 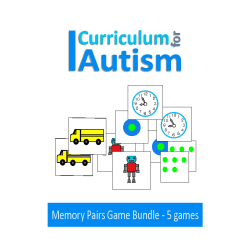 IEP Goals: Given a small group setting and an adult-led organized game, STUDENT will independently follow the rules of the game, in 4 out of 5 trials, by MONTH, YEAR.